Certainly we are out of touch with the world here in snowtime. But many of our happiest memories are winter memories. Each day is a sort of triumph. It takes so much effort and planning merely to exist and keep warm. But see, we have been comfortable, we have been content! And each night we go to our beds with a sense of having truly lived that day. Guess that you can see what might be on my mind these days. Now to see what's on yours! The snow is very pretty and I especially like the last picture. Thanks for hosting. The snow is beautiful Vee, and I love the first photo; one that should be framed. Some have mentioned a glitch. If you are unable to link, please refresh the page and try again. And, if it gets too stressful, contact me and I will link you from here. Thanks! Lovely winter wonderland with captions. Party on! Beautiful winter scenes and perfect for note cards! 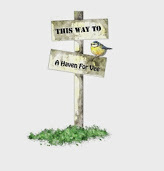 Beautiful images for note cards, Vee, especially with the sentiments you've added. Since you've had (and have) so much snow, might as well get all the mileage you can out of it. It is beautiful and those of us who long for a wee bit more are happy to see the photos. Thanks again for hosting! Vee, your snowy photos are just so pretty. The first one where the snow is all clinging to the branches is my fave. As always, thank you for hosting this fun party! These are marvelous! Great minds think alike because I did winter landscapes this time too, LOL. That first photo is a stunner with the lighting! Thank you so much for hosting these lovely parties. 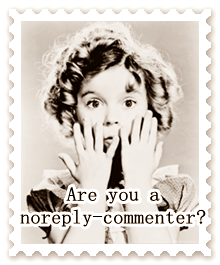 I have made many dear blogging friends here as a result! I just love your winter notecards Vee! These are just so pretty! Snow is everywhere ... LOL. Thank you for hosting this lovely party. 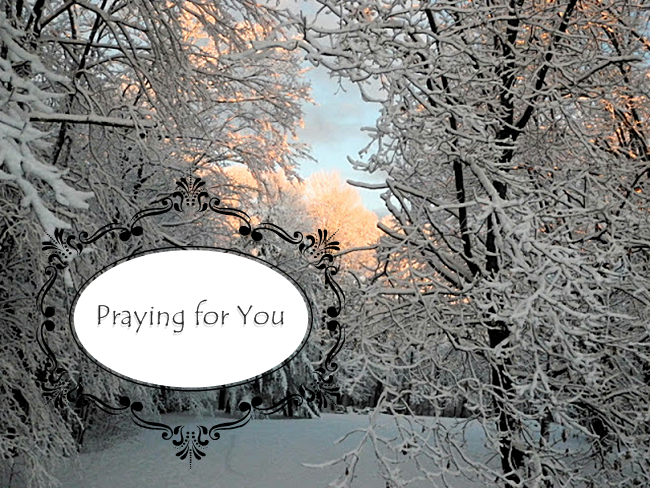 You have Winter...I have Spring, but how neat that we both have a praying card this month! Great minds.....! Thanks for the fun! I love that last card! You neat to print that out and frame it! Sweet hugs! Lovely winter cards! I should "order a set." Keep looking up is how my husband signs all his correspondence. You've done a nice job. Not sure why I had trouble before but all is well here now! The photos are beautiful Vee. I know everyone is probably tired of it by now, back there. It has been snowing hard just above me at Snoqualmie Pass. They have had to close I-90 several times for avalanche control. I can hear the big guns late at night sometimes. They really work hard to keep the roads safe. We just have had a dusting of snow down here but they say we might get some in a day or too. Vee, thank you so much for letting me join your card party with my watercolor note cards. I just love your beautiful photos of Winter. Living in Southern CA we are experiencing some spring colors early. I'm enjoying visiting all your friends and their note card photos. Those are marvelous photos. Love the deep long shadows. Snow nearly gone here. Some still around the edges. We glad when it is all gone. Your winter pictures are beautiful. Great note cards. Love your cards for February Vee. Hope your week is going well with your grands. I also love the sentiments on your cards...Very encouraging. Lovely note cards! The first one is just gorgeous! Oh no! I shouldn't be worried, though, right?! Glad you made cards from your snow photos, Vee. I tried to join five times, but couldn't connect. Your note cards are beautiful. You chose well. I love the words on them. Gorgeous photos of snow! I love the action shot. Beautiful Vee!! 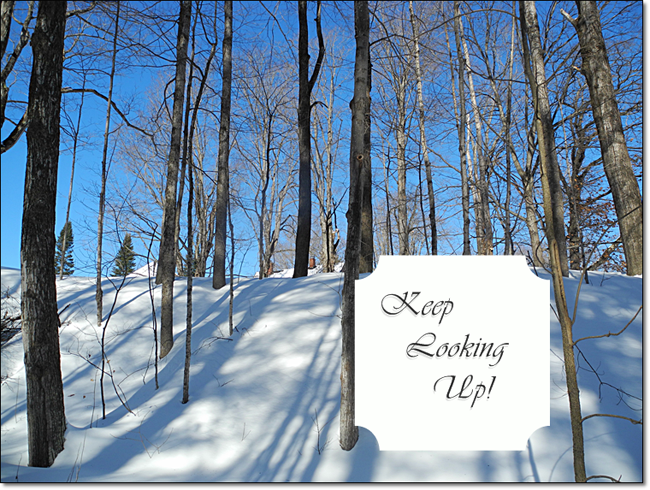 I especially love the "Keep Looking Up" card! I was going to link this time but alas, I've got too many cards on my post - maybe next time, now that I sort of know how to do it!!? Might need you to coach me through it when the time comes. Hope you are having a wonderful time with your grand boys. You must be having a very busy but wonderful week! Beautiful Vee! I'm linking up! I think I did it correctly . . . These are really beautiful snow scenes Vee and are great notecards. Have fun with the party!! I've visited a few that I follow anyway. You know, your snowy note cards are wonderful, but come August they may be life savers on a hot summer day! I love the words you have put on your cards Vee. Great addition! I'm so excited to have participated in your note card party for the first time!!. :). Your cards are simply amazing!! Pretty photos for note cards! I love the touch of pink in the first photo. Thanks for hosting this fun party! Oh, Vee, I really love your cards this week! I always like them, but these just seem exceptional! Best note cards you have ever done, IMO. Considering how many of your offerings I love and remember (like my previous favorite which was the one of the boys that you edited.) I love these and would very definitely send them as cards. I have said often that it's for no small reason that the "down" seasons of our lives are often called winter seasons. 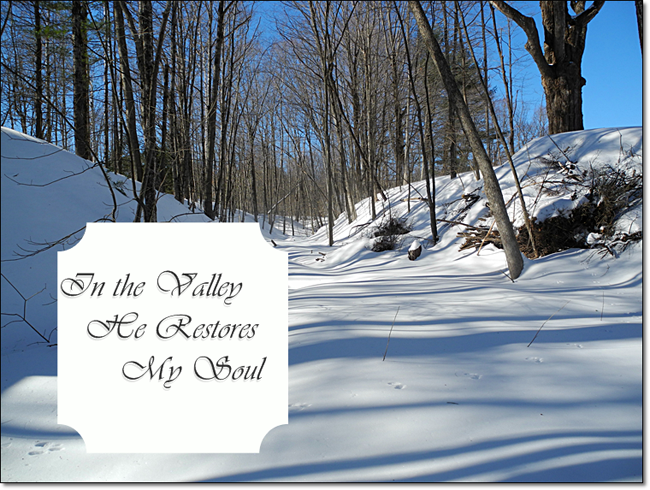 You show a beauty and encouragement in the winter with these that really and truly restores the soul. Great job, Vee. Great choices Vee - many of us choosing winter scenes and so interesting to note the differences in areas around the country. 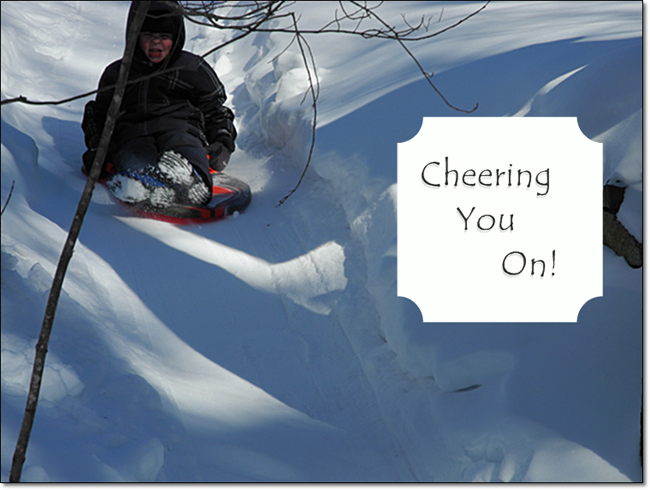 Love the last one with your grandson - children love the snow and it's probably doubly inspiring to conquer those steep hills with the Olympics going on! I also love 'Keep Looking Up' - for some reason trees are really inspiring when we get this perspective - makes one realize how tiny we actually are in the big scheme of things. Looks like my link didn't work again - don't know why that happens. Is there a way you can delete it and I'll try it again? Thanks Vee. Good showing today - we should start a card publishing company perhaps! I love your photos and the sentiments on them. Really nicely done! I am not playing this month but I am visiting all my Note Card pals to see their lovely offerings! Also - I love your header! Such pretty photos you've chosen this month. And the greetings are just right! for this "can't winter just be over?" time of year. I love the one with the grandboy on his sled! Vee, your note cards of winter are wonderful. My favorite is the last one! I love your wintertime note cards....and I love this fun party. p.s. me again...I still cannot link up. I'm sure it is a blogger problem. I have many blogger problems at present but just want to say thanks for hosting and I did try to link up! These are so beautiful! Winter photos have always been a favorite of mine. Love your winter photos Vee. You have to print out that last one for sure. I don't understand...are your photos for others to use as notecards? I visited some other blogs as well and the photos are wonderful! No. Thank you for asking. It was originally a way to feature well loved photos from the past. Trouble is that many ran out of material so it has since shifted to featuring at least one photo from the past and as many as three new ones. Some of us have printed up our note cards and use them for gifts or personal stationery. I was very pleased with those that I had done. I'm sure that you would as well. I love the snow and think it is so very white and beautiful! I don't find many people that share my view. Your photos are super beautiful!